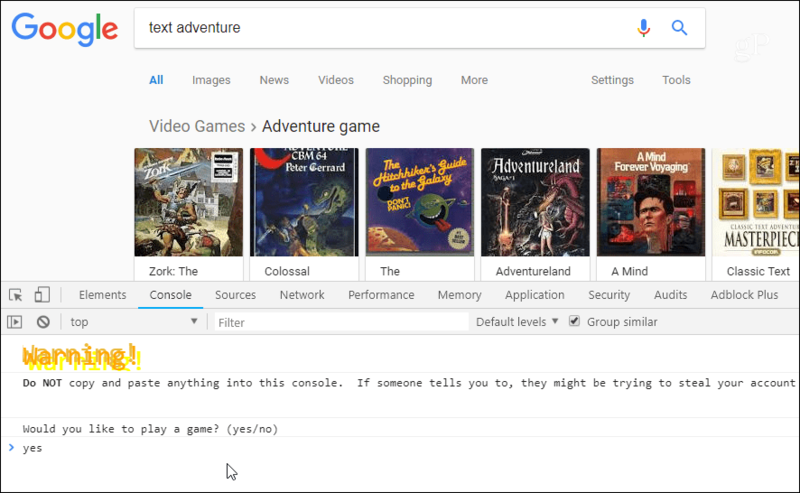 Google is well known for putting hidden games and other surprised into its products. And here is how to find and play the hidden text adventure easter egg. Google has a well-known reputation for including hidden features in its products. We have covered some of them in the past like making Google do a barrel roll and finding the bizarre octopus on Android 8.0 Oreo. And a few days ago, a new easter egg was brought to light by a user on Reddit. 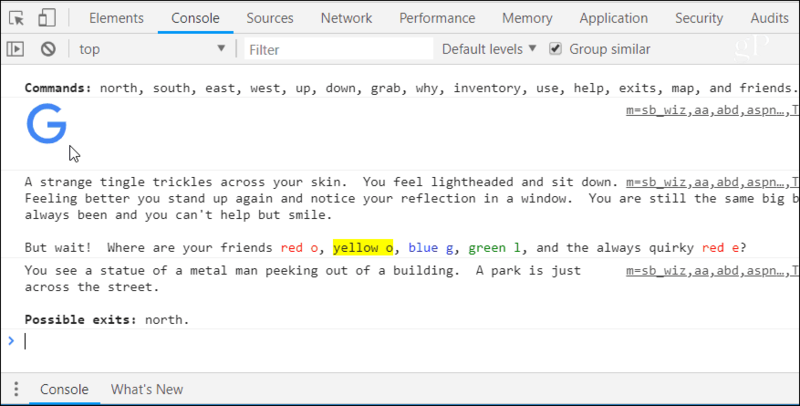 It’s a complete text adventure game that’s hidden in the developer console. Here is a look at how to find the adventure game and start playing it. Unlike some of the other Google easter eggs, you will want to use Chrome for the best experience. Although you should be able to use Microsoft Edge or Firefox, however, the text wrapping doesn’t work the best – especially in Edge (apparently Safari doesn’t work either). You’ll also want to disable your ad blocker if you’re using one for best results. First, make sure you’re on the Google homepage. Then in the search box, type: text adventure and hit Enter. After the search results come up hit Ctrl + Shift + J on Windows or Command + Option + J on a Mac. That will bring up the dev console and you should see “Would you like to play a game?” and you’ll obviously want to type: yes to start the game. Then the game begins. You control your character by typing simple commands like north, south, up, or down to navigate your way through the adventure. The basic idea is to find your “friends” which are the other colored letters that make up the Google logo. If you have played an old-school text game like Zork, you’ll get the idea of the game and should be able to breeze through it. If text-based games aren’t your thing, you might give up and quit early. If you’re bored at work, or just want something to do, give the text adventure game a try and see if you can complete the journey. And for more geeky fun, check out these 11 tech easter eggs. Have fun!